Since mid 2000, I've helped clients get stunning, low-maintenance, well formed dreads, free from chemicals & products! Now I'd like to show you exactly how to make dreadlocks properly using my Divine Hand & Hook method, for yourself or your friends. I'd love to help you achieve your dreadlock dreams! Get your free "how to make dreadlocks" eGuide below. 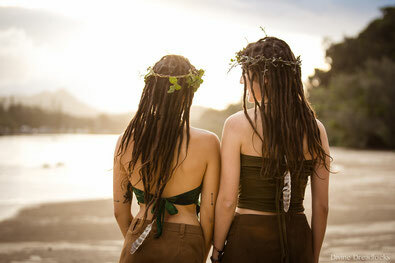 Learn how to make dreadlocks WITH US AND ENJOY THE FREEDOM OF HAVING YOUR OWN LIFESTYLE BUSINESS! I'm curious and want to know more about how to make dreads with the LIVE Loctician Certificate Course! welcome to divine dreadlocks. the MOST SUPPORTIVE PLACE TO LEARN HOW TO MAKE DREADLOCKS! Welcome to Divine Dreadlocks, a place for loving, locking and learning all about how to make dreadlocks! You can book in with Em to get dreadlocks, or if she is booked out then you can get some awesome dreadlocks made by dread Locticians certified in the Divine Hand & Hook method. You can also learn how to maintain dreads and how to start dreads in any type of hair. How to do dreads is a question we get asked all the time, especially when most people believe that it takes a long time to make dreadlocks, but honestly, it all depends on the method used. With the Divine Hand and Hook method you can get instant, neat, tight dreadlocks in a day! And the best thing is that they don't require much dreadlock maintenance because they're made so well from the start. We would like to put an end to the HUGE worldwide misconception, that having beautiful, neat, tight, well formed dreads, takes time.........because in the world of Divine Dreadlocks, it doesn't!! And it never did! Having lovely well formed dreads from day one, is simply a matter of method, NOT TIME! All it takes to get good dreadlocks, is a bit of sound knowledge about the various methods of making dreadlocks and then having the wisdom to avoid all the ones which require extra work and products to help get your dreads to form. Unless of course, you like the extra work and products!?! At Divine Dreadlocks, Em and the team have been providing the highest quality, all natural, dreadlocking services to clients from all around the world for over 18 years. There's now well over 2000 clients who have walked away with awesome neat, tight, well formed dreads after a days sitting. Not one of them had to buy product to help their dreads to mature, not one had to buy wax to stick them together. At Divine Dreadlocks we like to keep things simple and natural. And Em just loves sharing her knowledge with others and teaching people how to make dreadlocks, how to maintain dreadlocks and how to make dreadlock extensions for themselves, friends or clients. It was after hearing many sad stories about people disappointed by their first dreads, and feeling at full capacity with her own dreadlocking service that Em decided to share her self created method of how to make dreadlocks with the world, so that more people would have a much happier first, second or third dreadlock story and feel proud of their dreads. Dreads can either be high maintenance or virtually no maintenance, troublesome or easy, depending on which method is used to create them in the first place. If you go anywhere where the method does NOT involve locking each hair together with a small crochet hook, then we can guarantee that you WON'T get instant dreads. We don't want to freak you out or anything, but you'll need to work on them at least once a week (by palm rolling and adding wax or lock peppa) AND it will take about 6 to 12 months for for your new dread style to become permanent neat dreadlocks (and that's as long as you do the work)!! don’t actually start off locked! What you get is just a “dread” without the “lock”. Then it’s a mixture of time and effort expended by the wearer (after you’ve spent all that money) to get a nice strong dreadlock! Wouldn’t you prefer to get your dreads made permanently & neatly from the beginning?! Wouldn't you prefer not to have to worry about your #dreadlocks every time you swim or wash them. Wouldn't it be lovely to have no shrinkage, no breakage, no looseness, weak spots or fluffyness? Since the year 2000, Em (the founder, principle Loctician and Trainer of Divine Dreadlocks), has perfected the Thai crochet hook method into an art form that creates 100% natural permanent dreads which require very little maintenance, don’t involve loosing much length and don’t have any wax. And there's NO chemicals or products involved at any stage of the making or maintenance because the artisan lock is so strong it doesn't need anything else! This incredible method is called the: "Divine Hand and Hook Method". It's 100% eco friendly! And it rocks! It is an art form involving detailed locking of each and every strand of hair - without the use of any products, nasty chemicals or wax. It’s 100% natural dread creation. The only things used is SKILL, a small hook, a comb and your hair. So if you want real, natural, beautiful dreadlocks without any other yucky stuff in them, let Divine Dreadlocks help you! Check out our website to become well informed about dreads so you can feel rest assured that you're making the best decision you could make for your dreadlocked journey. And if you want more proof that the Divine Hand & Hook method is the best choice for your dreads, or the best choice for learning how to make dreads read our client testimonials to see how happy people are with their Divine Dreadlocks! If we're full, BOOK in to see a Divine Dreadlocks Certified Loctician. Get informed about how dreadlocks are made, discover the various methods that exist and see their results. Learn which method never requires locking products or any dread rolling because it instantly locks any type of hair! Learn how to prepare your hair to be made into dreadlocks easily. Learn how to maintain your dreads without using any products, wax, split and tuck or looping through. Learn how to make neat, tight, dreadlocks using the Divine Hand & Hook method. Browse through our FAQ's where all your questions about dreads can be answered. Learn all about the cost involved in getting dreads and having them maintained. Learn how to care for your new dreads. Learn all about getting or making dreadlock extensions. Enrol in the Natural Loctician Certificate Course & create a lifestyle business as a Dread Loctician/Artist. is to get the opinion of their clients! the Divine Hand & Hook method. Our mission: to help more people get dreads they love...naturally!